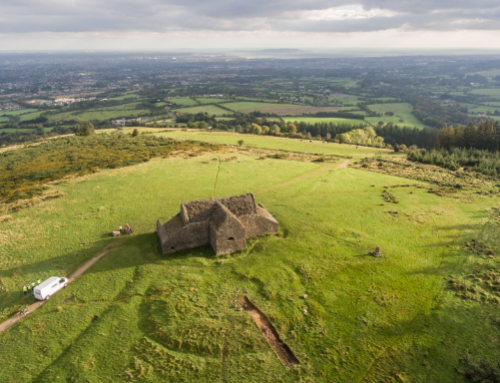 Megalithic Art Discovered at the Hellfire Club. Sitting partially exposed in the hollow of the strange mound behind the Hellfire Club, a dark lump of igneous rock served as a handy border to many bonfires over the centuries. However, those who enjoyed the warmth of the fire while lying up against the comfortably curved bank of the mound may not have realised that the mound they rested upon was the remains of an ancient tomb, and that plain looking dark stone was carved with symbols and designs that are over 5,000 years old. The discovery of the artwork was the result of incredible serendipity. The surface of the stone has been damaged by fires and weathering, so the artwork is almost completely imperceptible to the naked eye. Had we dug our trenches anywhere else on site we would not have discovered it, and had we excavated during the summer, the higher flatter sunlight may not have revealed the faint trace of the artwork. As the stone was sitting in a disturbed modern layer of material relating to picnics and parties, it was outside of its original context. We removed it quite early in the dig, though due to the many fires that had been lit upon it, it fractured into four large fragments as we began to lift it from the trench. As we did not originally notice anything particularly unusual about the stone, we (with some difficulty) lifted it out of the trench and set it on the side, so it would be close at hand for when we began to backfill the trenches. Early in the morning of Wednesday 19th October, the low autumnal sun hit the stone at an angle that revealed a previously unnoticed long curving line. As we looked at the line, the changing light revealed that the line cut over the top of two faint concentric circles, one inside the other. This is a motif that appears in megalithic art at some of the most famous passage tombs in the country. With great excitement, I sent images to Professor Muiris O’Sullivan of UCD and Dr Elizabeth Shee Twohig, who are both renowned experts in megalithic art. Both were very excited by the find, and Elizabeth, accompanied by specialist photographer Ken Williams (of Shadows and Stone) arrived on site to carry out photogrammetry, to reveal details invisible to the naked eye. 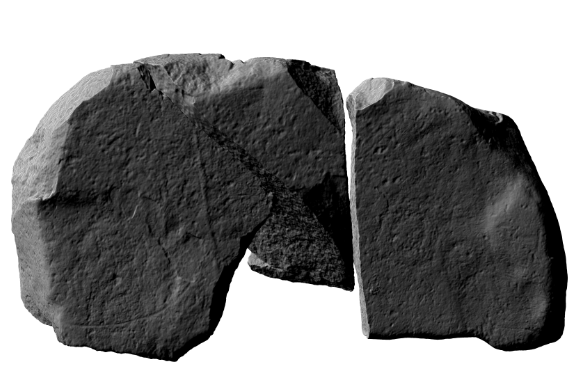 The following day, Gary Devlin, Rob Shaw and Marie Brohet of the Discovery Programme carried out a laser scan of the stones, to fully record all of the details. 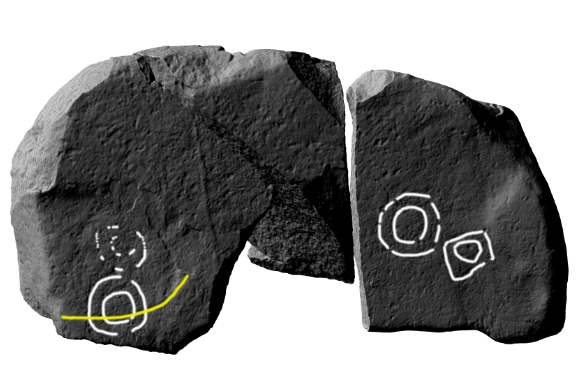 The work by Ken and the Discovery Programme revealed that the stone bore even more art than we had originally thought. This analysis is still at an early stage, so all representation here may not fully reflect the art depicted on the stone, and may be subject to change. Usually, megalithic art occurs on the stones that form the kerb surrounding the outside of the tomb, or on the stones that line the passageway or burial chamber. The ‘art’ is characterised by carved and ‘picked’ abstract designs, perhaps the most famous examples come from Newgrange and Knowth with spirals, chevrons, zig-zags and concentric circles being some of the more familiar designs. What the art means has been long debated. Some believe that they represent the artwork produced during states of altered consciousness, perhaps through shamanic ritual or consumption of mind-altering mushrooms or herbs. Perhaps they were abstract representations of astronomical features, or perhaps simply abstract art (though as the symbols appear regularly at a number of passage tomb sites from this period surely the symbols had real meaning). Perhaps the famous spirals and circles of megalithic art represent tree rings, a visible marker of the passing of time for these Neolithic farmers. The confirmation of megalithic art gives further evidence that the site is a Neolithic passage tomb, as this type of megalithic art is particularly associated with this type of monument. 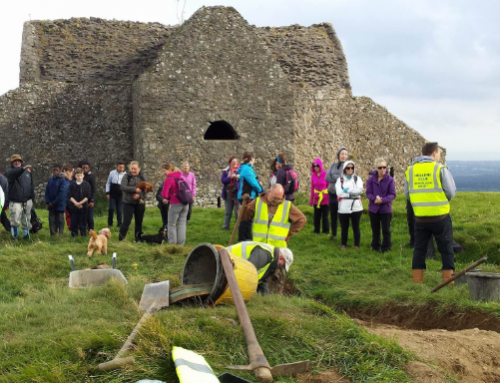 This exciting discovery helps to reinforce the importance of the tomb behind the Hellfire Club, and it gives a tantalising glimpse of what the original tomb may have looked like before its destruction in the 18th and 19th centuries. The stone and its art is now with the National Museum of Ireland, where it will be further examined and studied by experts and specialists to see if it will reveal any more secrets. You can enjoy a great 3-D model produced by the Discovery Programme below. We are extremely grateful to Professor Muiris O’Sullivan, Dr Elizabeth Shee Twohig, Ken Williams, the team from the Discovery Programme and the staff of the National Museum of Ireland for all of their help and support. The circle on the curved line couldn’t possibly indicate that our ancestors had an idea of lunar orbit, could it? That’d be something else! Also, I may be imagining things, but I can see a much smaller circle just above the double circle on the right-hand side! For the smaller circle that might well be there! We’re going to be using a range of different techniques that should hopefully identify all of the art. Part of my hope with this post is that people will follow your lead and if to let us know if they see art that we’ve missed. Thanks a million for your comment! Those two images on the left look like the proximity of the two tombs on the hill. A map? @Keith, yes, or both the images and the tomb layout deliberately reflecting the same symbolic meaning? Hi Keith, intriguing suggestion. One of the theories about the meanings of megalithic art is that they may represent maps. Certainly something to consider! It would be interesting to do a paper cast of the stone and see if there are any traces of other engravings that are hard to spot with the naked eye. It almost looks like the hint of chevron or lozenge shapes above the concentric circles. I was taught how to take paper casts in Australia, so if you need any advice, let me know. Hi David, I’m afraid that art was done some time in the 1970s. It’s unfortunate as there really is a prehistoric tomb there too. Thanks for this information, even if it’s a little disappointing. Thinking about it, the inscribed stone at Tibradden does look rather fresh for neolithic art. Does any known source from the time mention the stone’s appearance? Perhaps’s it’s not worth any thought. Hi George. Unfortunately none of the known early documents mention megalithic art. Now that megalithic art has been discovered on one stone, do you intend to check other stones in the area for similar carvings, or has this been done already? There appears to be the remains of a stone circle or arc surrounding the larger tomb and there is a fallen standing stone some metres away from it. Wouldn’t it be worth checking these to see if there are similar carvings on them? Hi Janet, that was one of the first things we did as soon as we discovered the art. 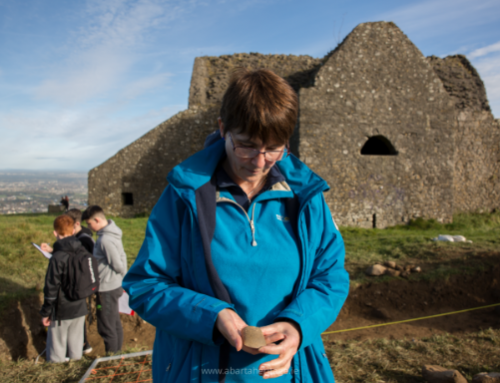 We checked all the stones visible in the remainder of the kerb (what you describe as the stone circle) surrounding the larger tomb, and we checked every large stone that we encountered during the excavation. 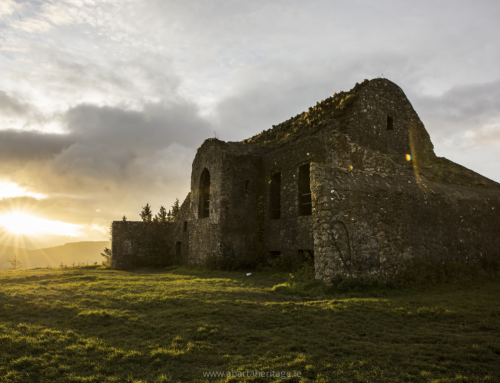 No other art was noticed, but I do hope to laser scan the interior and exterior of the Hellfire Club to see if we can identify any art there. Hello. This is an amazing find. I really enjoyed following the progress of your excavation. For the 3D model, did you use photogrammetry or laser scanning? Keep it up! The art is so weathered and difficult to discern, I would love to use a variety of techniques to record it as I think it would make a good test case to see what techniques can produce the most definition with such ephemeral art.